Upon opening the door of the Minghui School, held in a YMCA hostel, what first met my eye was a group of children sitting around their teachers to learn the fifth Falun Gong exercise. Though the youngest was only three years old, and the oldest one was about eleven or twelve years old, I was touched by their composed and firm countenances. 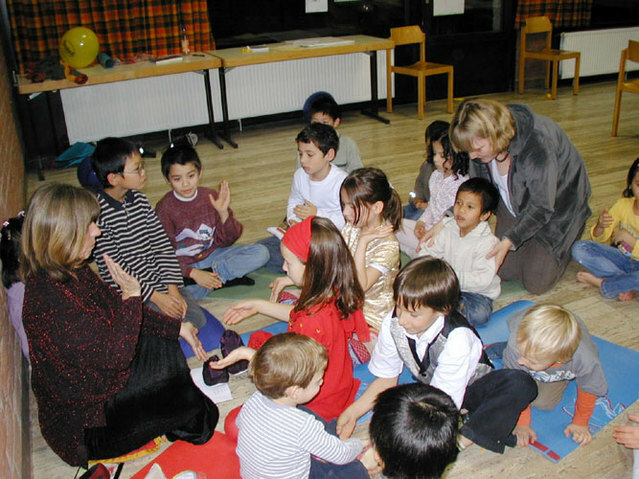 With the efforts of several German Falun Gong practitioners, the Minghui Elementary School was established and held from December 27th to 29th, 2006, in the city of Wetzlar. Students went to the school every day, where they studied the main text of Falun Dafa, Zhuan Falun, practised the Falun Gong exercises, learned how to paint the Falun emblem, practised a 'Feitian (celestial maiden) dance' and sang songs together. The students from the Minghui Elementary School were also invited to perform at a mini Lunar New Year Spectacular organised by the practitioners after the German Falun Gong Experience Sharing Conference. Some of them started to cultivate Falun Gong along with their parents after returning from the Minghui Elementary School. The father of Fadu, a little Chinese girl, died. When Fadu was smaller and her father was alive,he used to practise Falun Gong in China. But later, because of practising Falun Gong, he was persecuted to death by the Chinese police. A song recounting Fadu's story was composed by a German practitioner. When it was sung by these innocent children, their tender voices really touched people’s hearts. When asked what was the motivation for them to establish the Minghui School, Ms. Edith, one of the teachers in charge of this project, told our reporter that among Falun Gong practitioners, many have children. As they are usually so busy that they might neglect their children’s cultivation from time to time; therefore, they wanted to make use of the gathering attended by German Falun Gong practitioners to establish the Minghui School. Ms. Edith added that though the duration of the Minghui School was not very long, the programme was well designed. Students got together to study Zhuan Falun, practice the exercises and learn to paint as well as sing. The kids didn’t attend the Minghui School as a formality, and instead they clearly knew what they were supposed to do there. Ms. Edith also mentioned that attending the School is a process of cultivation. During the course of conducting this programme they persistently exchanged viewpoints with the children to let them know the relationship between virtue and karma as well as the meaning of holding the New Tang Dynasty Television’s New Year Spectacular for society and people. Through practising and singing the song Fadu Has Lost Her Father, the children came to know about the persecution of Falun Gong in China, the reasons why, and what they can do to help stop the persecution.